Shipping Case Corporation specializes in the design and manufacture of custom rackmount case technologies for both commercial and MIL-SPEC rackmount case applications. 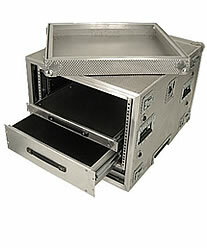 Impervious to high/low temperature extremes, altitude, rain, sleet, snow, sand and dust, all our aluminum shipping case, transit case and rackmount case technologies meet ATA 300,Category 1 specifications and are easily transportable in both commercial and military environments, regardless of geographical location. Ideally suited for both industrial as well as military and defense applications, our welded aluminum shipping cases are available in both standard rackmount case and custom rackmount case configurations. Compliance to a wide range of military rackmount case applications. As North Americas leading manufacturer of custom rigidized aluminum rackmount cases for commercial and military applications, we at Shipping Case Corporation hope you will find this site informative and helpful in defining your specific case requirements. Copyright © Shipping Case Corporation. All rights reserved.